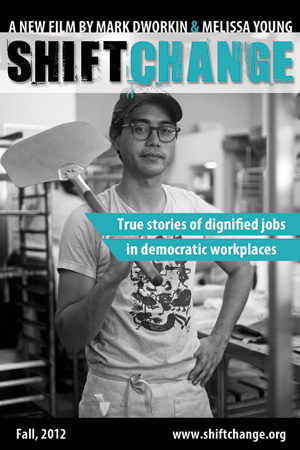 SHIFT CHANGE–the new documentary about how worker-owned cooperatives are reshaping the economy around Boston, the US, and the world– will soon premiere in Boston! We’re pleased to announce two upcoming screenings, both of which are free and open to the public. Event Details: Reception at 6pm with coffee from Equal Exchange and light snacks from local vendors. A Q&A with filmmakers Melissa Young and Mark Dworkin will follow the screening. Transit / Parking: Take #96 bus (Medford Sq via Davis Sq) to Boston Ave & Winthrop St., walk for 8 minutes); free parking in a designated lot, behind the Fletcher school, on Curtis St). Event Details: Q&A with filmmakers Melissa Young and Mark Dworkin will follow the screening. Boston Area screenings presented by: Boston Area Solidarity Economy Network (BASEN), a local chapter of the U.S. Solidarity Economy Network (www.ussen.org), and of the Intercontinental Social Solidarity Economy Network (www.ripess.org). Co-sponsored by: Equal Exchange, Trillium Asset Management, Red Sun Press, Northeastern University Social Enterprise Institute, Somerville Climate Action, Boston Collective Delivery, Ownership Associates, South Mountain Company, JP Forum, JP New Economy Transition, New Economy Institute, Cooperative Fund of New England, the Tellus Institute, Gurmylay: Growing the Green Economy, Al Campbell of the Union for Radical Political Economics SC, and Harvest Co-op. Also cooperating to bring this great film to you are the Worker Owned and Run Cooperative Network of Boston (worcn.org), Jobs with Justice, Democratic Socialists of America, Somerville Rep. Denise Provost, Dollars & Sense, Mass. Global Action, Jewish Labor Committee, Dorchester Community Food Co-op, Occupy Boston Sustainable Economy Working Group, and Boston Workers Alliance.